Fantastic example of a West Country farmhouse cheddar, with a creaminess and slightly earthy flavour. Made by Tom Calver of Westcombe Dairy in the Batcombe Vale of Somerset using the milk from the Friesian cows farmed by his father. This farmhouse cheese making business has been making its renowned cheddar since1890 and now make over 100 tonnes of Cheddar a year, all of which is made to the highest quality using traditional methods. Tom Calver of Westcombe believes the success of his Cheddar lies in their ability to exploit the local Westcombe terroir and letting it enhance their cheese making. From the richness of the milk to the special conditions of their cheese ageing room, everything they do revolves around letting the milk express itself in the finished cheese. Westcombe Cheddar is one of very few cheddars to be made by hand in the Westcountry using traditional rennet, unpasteurised milk and pint starters - something that qualifies it as a Westcountry Farmhouse Cheddar which is Protected Designation of Origin (PDO). 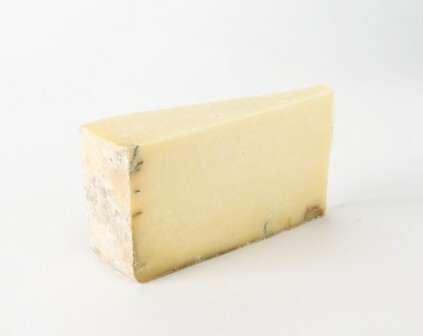 Westcombe Cheddar has a deep complex flavour with a mellow lactic tang and long notes of citrus, hazelnut and caramel. The texture is structured and firm, with a smooth breakdown that keeps the flavours lingering on your palate. This cheese is often called a 'five mile Cheddar', as you’re still tasting it five miles down the road. Westcombe Cheddar picked up two awards at the 2017 British Cheese Awards - Best Cheddar and Best PDO/PGI Cheese.